Frost Clear, Super Wave Frosted Bags, 18" x 15" + 6"
Dimensions: 18" x 15" + 6"
Frost Clear, Super Wave Frosted Bags, 12" x 11" + 4"
Dimensions: 12" x 11" + 4"
Purple Grape, Super Wave Frosted Bags, 12" x 11" + 4"
Citrus Green, Super Wave Frosted Bags, 18" x 15" + 6"
Citrus Green, Super Wave Frosted Bags, 12" x 11" + 4"
Sizzling Pink, Super Wave Frosted Bags, 12" x 11" + 4"
Lagoon Blue, Super Wave Frosted Bags, 12" x 11" + 4"
Purple Grape, Super Wave Frosted Bags, 18" x 15" + 6"
Citrus Green, Super Wave Frosted Bags, 22" x 18" + 8"
Dimensions: 22" x 18" + 8"
Lagoon Blue, Super Wave Frosted Bags, 18" x 15" + 6"
Frost Clear, Super Wave Frosted Bags, 22" x 18" + 8"
Sizzling Pink, Super Wave Frosted Bags, 18" x 15" + 6"
Purple Grape, Super Wave Frosted Bags, 22" x 18" + 8"
Lagoon Blue, Super Wave Frosted Bags, 22" x 18" + 8"
Sizzling Pink, Super Wave Frosted Bags, 22" x 18" + 8"
You will not get this beautiful and unique Super Wave Frosted Bags anywhere else at such an amazing price. Amaze your customers with these trending carrying bags to pack their sale items. 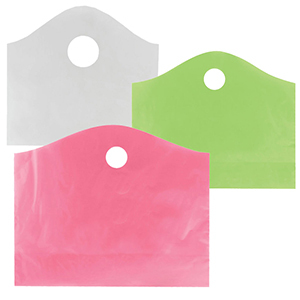 These US made translucent Super Wave Frosted bags are made with 15% to 25% recycled material and make the best options for carrying all your customer's shopping items. Super Wave Bag features a comfortable die cut handle, extra wide opening for quick and easy loading, and a flat bottom to prevent spills. Choose from pink, citrus, purple, blue, clear and 2 sizes. All wave shopping bags are sold 250 per case. Wave Shopping Bags that are 12"x11"+4" are 2.0Mil, all other superwave bags are 2.25Mil.